SunCommon, a VBSR Champion Member and Vermont based solar company, is well known for building a resilient power system while using their business as a force for good. What you might not know is that early in 2018 SunCommon identified that a core component for driving forward their inner purpose was to develop a thriving leadership culture. 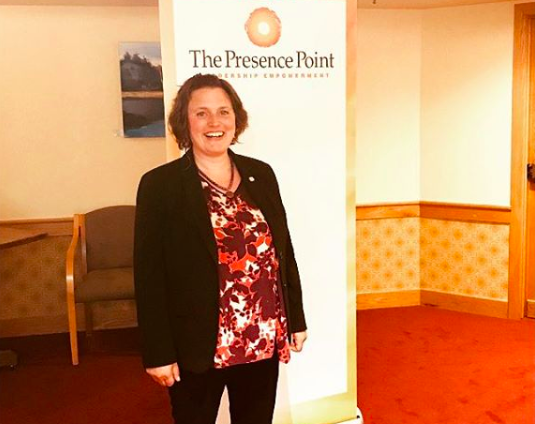 Auspiciously, at exactly that moment, fellow VBSR member Sarah Lipton (leadership mentor from The Presence Point, LLC) was introduced to SunCommon’s former Happiness Resources Manager, Jessica Sabick. At the same time, Erin Lander was transitioning into her new role as Leadership Development Coach on SunCommon’s HR team. Sparks from that initial meeting led to an intensive strategic planning process through which Sarah, as leadership development expert, supported the creation of a comprehensive program that was successfully unrolled and delivered for the rest of 2018. SunCommon’s Leadership Development Program now consists of individual coaching, peer­learning sessions, leadership workshops and a robust pool of leadership resources. The management team blossomed in resonance to the necessity, power and practices of genuine leadership that Sarah specializes in teaching. At the initial half­day workshop Sarah led, entitled Staying Engaged Through Change, the leadership team aligned to the basic principles of presencing, reflecting, connecting and communicating from a space of authentic presence in order to create a more robust, thriving and engaged culture. Unfolding over the next eight months, Sarah provided individual engagement with the management team, guiding a transformative journey of leadership development. ThroughThe Presence Point, Sarah is available to companies to serve their missions by supporting their leadership team’s development in individual, group and all­staff capacities. When a company is aware that it needs to support a culture from the inside, it is able to not only talk the talk, but walk the walk. Congratulations, SunCommon, for making strides to walk the walk!